SMRR, a powerful renters’ rights block that also fought to keep the city from growing too high. Now it seems nothing can stop its growth, particularly in downtown. There, some of the world’s top architects are playing in the sandbox, which is fast filling with new hotels, shops and housing that are pushing against previous height constraints. The local Santa Monica Daily Press just published renderings of a mixed-use project by OMA (pictured left), helmed by famed Dutch architect Rem Koolhaas, with a team that includes local architecture firm Van Tilburg, Banvard & Soderbergh. 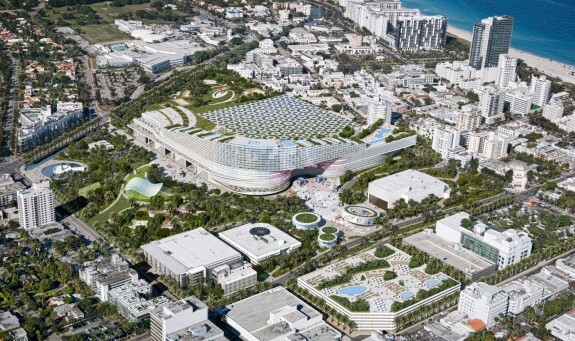 SMDP reports that The Plaza at Santa Monica — 148 feet high, reaching 12 stories and a total of 424,000 square feet — and including a 225-room boutique hotel, restaurants, shops and a marketplace “offered the most compelling design, highest number of publicly available parking spaces and a satisfactory community outreach process.” Of the 1,220 parking spots, 580 would be open to the public (Question: isn’t the Expo Line, under construction now and a magnet for much of the new development, supposed to get people out of their cars and on to public transit?). But the scheme did not include affordable housing, a component of competing proposals. The City Council meets August 27 to approve the project. Koolhaas is known for dramatic architectural statements (Seattle Library; Beijing’s CCTV building); one wonders if Santa Monica’s notoriously tight oversight and community engagement will dim Koolhaas’ verve, or enrich the project. Note that one of the concerns among Santa Monicans is that their downtown might become like Miami Beach. And speaking of starchitects (a much overused term), Frank Gehry and his team are busy developing the design for their project for downtown Santa Monica. 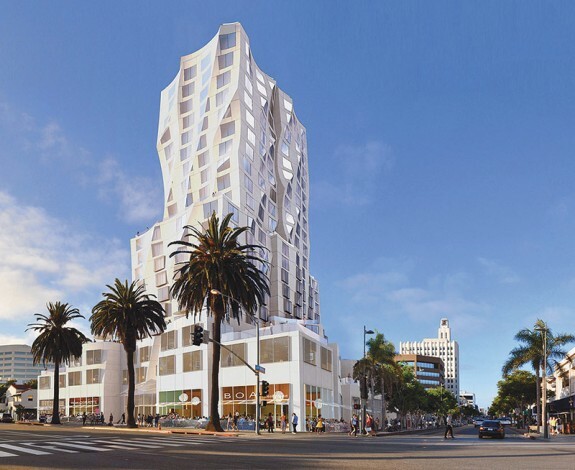 The developer of the proposed 22-story tower (rendering shown below), to be located near the intersection of Ocean Avenue and Santa Monica Boulevard, wants to build a hotel, condos, restaurants and retail space and, a ground level, an adjacent museum, whose use is yet to be defined. While it will be higher than some of the chunky, nearby mid-rises, it will also be more slender, stepping back as it rises. For Gehry, this is a homecoming, since he lives in Santa Monica and made his early mark here, with his deconstructed house that catapulted him to global fame (with Santa Monica’s stringent design review process, one wonders if an unknown designer now could get away with a similarly iconoclastic design), and his parking garage for Santa Monica Mall with huge, diaphanous, mesh lettering that showed how a mundane building could become a marvelous supergraphic. Hopefully the Ocean Avenue project will have some of that thrilling freshness. If not, it and the Koolhaas-branded commercial project could serve as further evidence to Santa Monica’s oldtimers that their laid-back beach town has morphed into Miami West.